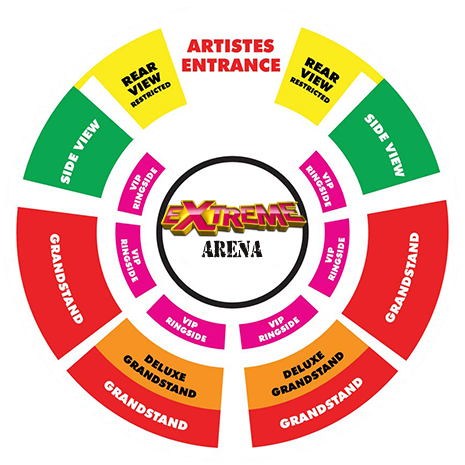 If tickets are not available online, there is ALWAYS availability at the Circus Box Office on site. Please arrive at least 45 minutes before the show to purchase unreserved tickets. PHONE LINES ARE NOW OPEN, 9am to 9pm daily. The Circus Box office will be open daily, on site, on advertised dates 9am to 9pm. There are 500 unreserved seats available for every performance. Disabled customers must book by calling the circus ticket office on 0203 375 3970, to receive a special discount price and be guaranteed accessible seats. Disabled customers must book by calling the circus ticket office on 0203 375 3970. To find out more about our Speedypass offering, head on over to our Speedypass information page. Rear Circle: Tiered seating with a restricted view of stage. Side Circle: Tiered seating with a side view of stage. Grandstand: Tiered seating with a front view of stage. Grandstand Deluxe: Deluxe cushioned seats on first five rows facing stage. VIP Ringside: Three rows of individual chairs all on floor level, surround the stage. This area is wheelchair accessible & step free. A child from the age of 2 to the age of 15 will require a child ticket. Under 2 years of age, no ticket is required, and child can sit on parents' lap. Anyone from 61 years of age can purchase a child ticket. We may require proof, to provide discounts and concession tickets. Purchased tickets are not refundable, this applies to tickets bought directly to our ticket office or via an online re-seller. We can apply changes to a reservation based on availability, an administration charge of £2 may be applied for each change. Any ticket related issues should be raised immediately via our box office. Issues or alterations for shows that have already happened, cannot be satisfied. Management reserve the right to refuse admission, or ask to leave the premises, for reasons of safety and order.